Brought to you by the Delaware Living Shoreline Committee, this interactive map provides information on living shorelines that have been installed in the state of Delaware. Stable shorelines are needed to protect coastal communities and serve as important habitat for native animals. But common methods of shorelines stabilization do not adequately serve both purposes. Living Shorelines are the solution. Living Shorelines are shorelines that are actively managed to both control erosion and to protect the benefits of natural shorelines. They are engineered using native plant material, shellfish, sand, and some hard structures. In addition to preventing erosion, living shorelines can reduce wave energy, trap floating sediment, and filter stormwater runoff from lawns and pavement – all while maintaining natural beach or wetland habitats. The shorelines of Rehoboth, Indian River, and Little Assawoman Bays and their tributaries have experienced extensive shoreline erosion as the result of boat wakes, sea level rise, and storm wave action. 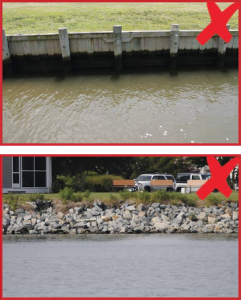 Shoreline property owners have traditionally defended their shorelines from erosion by hardening them with stone rip-rap, or with wood or metal bulkheads. But these techniques have a large environmental cost. Hardened shorelines eliminate sandy beaches and salt marsh habitats, don’t filter pollutants from surface runoff, reduce the resiliency of the shoreline to withstand storms, flooding and the effects of sea level rise, and can amplify and reflect wave energy, leading to increased erosion on nearby shores. With such important issues at stake, it’s no wonder that Living Shorelines are growing in popularity! Protection: Absorbs wave energy from storms rather than amplifying and reflecting it and effective control of erosion. The Delaware Center for the Inland Bays (CIB) Living Shoreline Initiative aims to protect and restore shoreline habitats by maximizing the amount of natural Bay shoreline in our watershed. The CIB also aims to improve water quality through shoreline stabilization and ecosystem enhancement, while providing public education and training opportunities for local contractors. The Bethany Loop Canal Project was the first of six planned projects to be installed around the Inland Bays, and was completed in 2015. Additional projects are in the planning stage and will be announced soon! The Center for the Inland Bays is also a supporter of the statewide Delaware Living Shorelines Committee which was formed in 2013 with the goals to advance the use of living shorelines throughout the state. An online interactive map was created to share information about living shoreline demonstration projects that have been implemented by the committee and its many partners.